Zodiac (Case 14): IL1RAP — A NEW Marker for Alzheimer’s Disease and an OLD Fella for Cancer — Supports Negative Correlation between Alzheimer and Cancer! Zodiac (Case 13): Foxp3 — Why is it Potentially Nobel-Prize worthy. Zodiac (case 11): Are there similarities in genetic interactions between Cancer and Neurological Disorders? Zodiac (case 10): PTEN and MYC — Is there a middle man? This is the 14th-article of a blog series aiming to introduce Zodiac, a comprehensive tool that reveals genetic interactions in cancer by big-data computation. An introduction of Zodiac is in the 1st article here. IL1RAP is related to a gene called IL-1 (Interleukin 1) family, which induces synthesis of acute phase and proinflammatory proteins during infection, tissue damage, or stress, by forming a complex at the cell membrane with an interleukin 1 receptor and an accessory protein. IL1RAP is the gene that encodes an interleukin 1 receptor accessory protein. IL-1 is intensely produced by tissue macrophages, monocytes, fibroblasts, and dendritic cells, but is also expressed by B lymphocytes, NK cells and epithelial cells. They form an important part of the inflammatory response of the body against infection. These cytokines increase the expression of adhesion factors on endothelial cells to enable transmigration (also called diapedesis) of immunocompetent cells, such as phagocytes, lymphocytes and others, to sites of infection. Here I am again, finding a newly discovered disease biomarker for Alzheimer potentially related to cancer as well. Let’s take a look at IL1RAP in the literature. Just a few months ago, the prestigious journal PNAS published a paper showing an antibody suppressing IL1RAP expression show therapeutic effects in xenograft models of acute myeloid leukemia (AML). The gene has been shown to be a therapeutic target for leukemia and auto-immune diseases such as rheumatoid arthritis, in which IL1RAP is typically over expressed. Interestingly, the problem in Alzheimer is the opposite. IL1RAP is believed to be under expressed and the under expression causes disease progression. Therefore, based on the IL1RAP gene, there should be a negative correlation of some cancer, such as leukemia, and Alzheimer, since the expression of IL1RAP decreases in Alzheimer and increases in leukemia. Is it true? Turns out this negative correlation has been reported extensively in the literature, with a most recent report published in August, 2015: through a meta-analysis and systemic review, an “inverse relationship” is found between Alzheimer and cancer, where individuals with a cancer history having 40% reduced risk than those without. The study is based on a retrospective review of publications in PubMed, Web of knowledge and the Cochrane library databases. As to which genes are associated with IL1RAP in Zodiac, here is a quick summary. In short, a lot of important cancer genes! First, in the genes with strong copy number — copy number association with IL1RAP, a couple of genes stand out. CLDN1 Tight junctions represent one mode of cell-to-cell adhesion in epithelial or endothelial cell sheets, forming continuous seals around cells and serving as a physical barrier to prevent solutes and water from passing freely through the paracellular space. These junctions are comprised of sets of continuous networking strands in the outwardly facing cytoplasmic leaflet, with complementary grooves in the inwardly facing extracytoplasmic leaflet. The protein encoded by this gene, a member of the claudin family, is an integral membrane protein and a component of tight junction strands. CLDN1 is related to sealing the blood brain barrier (BBB), which is critical to many neural disorders. MAP3K13 The protein encoded by this gene is a member of serine/threonine protein kinase family. This kinase contains a dual leucine-zipper motif, and has been shown to form dimers/oligomers through its leucine-zipper motif. This kinase can phosphorylate and activate MAPK8/JNK, MAP2K7/MKK7, which suggests a role in the JNK signaling pathway. This gene is interesting since JNK pathway has been targeted for several neural disorders. Second, I looked up genes that co-express with IL1RAP in Zodiac. Not surprisingly, many immune and cancer related genes showed up. POU5F1 This gene encodes a transcription factor containing a POU homeodomain that plays a key role in embryonic development and stem cell pluripotency. Aberrant expression of this gene in adult tissues is associated with tumorigenesis. This gene can participate in a translocation with the Ewing’s sarcoma gene on chromosome 21, which also leads to tumor formation. OGT This gene encodes a glycosyltransferase that catalyzes the addition of a single N-acetylglucosamine in O-glycosidic linkage to serine or threonine residues. Since both phosphorylation and glycosylation compete for similar serine or threonine residues, the two processes may compete for sites, or they may alter the substrate specificity of nearby sites by steric or electrostatic effects. The protein contains multiple tetratricopeptide repeats that are required for optimal recognition of substrates. Remark: Note that “serine” is an amino acid and a form of serine has been described as a potential early diagnostic marker for Alzheimer! BRCA2 Inherited mutations in BRCA1 and this gene, BRCA2, confer increased lifetime risk of developing breast or ovarian cancer. Both BRCA1 and BRCA2 are involved in maintenance of genome stability, specifically the homologous recombination pathway for double-strand DNA repair. The BRCA2 protein contains several copies of a 70 aa motif called the BRC motif, and these motifs mediate binding to the RAD51 recombinase which functions in DNA repair. FCGR2A This gene encodes one member of a family of immunoglobulin Fc receptor genes found on the surface of many immune response cells. The protein encoded by this gene is a cell surface receptor found on phagocytic cells such as macrophages and neutrophils, and is involved in the process of phagocytosis and clearing of immune complexes. KRT6C Keratins are intermediate filament proteins responsible for the structural integrity of epithelial cells and are subdivided into epithelial keratins and hair keratins. Remark: KRT6C seems another suspect related to neural disorders. Genes such as CD58 and REL also showed up; they are related to T- and B-lymphocytes. In conclusion, IL1RAP seems to be a gene that plays key roles in both cancer and Alzheimer. However, it appears to be over expressed in leukemia and under expressed in Alzheimer, which supports the negative associations of the two diseases. This is the 13th-article of a blog series aiming to introduce Zodiac, a comprehensive tool that reveals genetic interactions in cancer by big-data computation. An introduction of Zodiac is in the 1st article here. There has been news about a gene called Foxp3, including a prediction from Reuters stating that the gene might be worth a Nobel Prize (see here). Foxp3 is a transcription factor that potentially regulates many important genes. The main function of Foxp3 is predicted to be regulating the development and function of T cells. It is believed that a subpopulation of T-cells, called regulatory T cells (Tregs), is specialized in suppressing unnecessary immune function, to avoid auto-immunity (i.e., immune cells attacking the host’s own healthy tissues). When auto-immunity occurs, auto-immune diseases such as inflammatory bowel disease or lupus can occur. Also, in transplantations and immune cancer therapies, avoid auto-immunity is an important and challenging task. Tregs are T-cells that regulate other non-Treg T-cells that execute immune functions. A few key functions of Foxp3 have been described in the literature, mainly from the landmark paper Sakaguchi et al. 2008, Cell. The first author was invited to give a research lecture at the Nobel Forum in 2013. 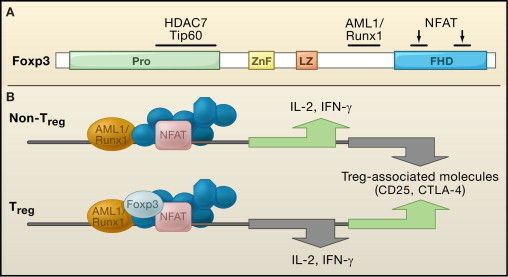 Foxp3 is believed to suppress the transcription of IL-2 in Tregs but also activates important surface markers such as IL-2 receptor (CD25), CTLA-4 and GITR. Figure below is taken from Sakaguchi et al. (2008). Zodiac confirms these relationships except the one for GITR. See figure blow. 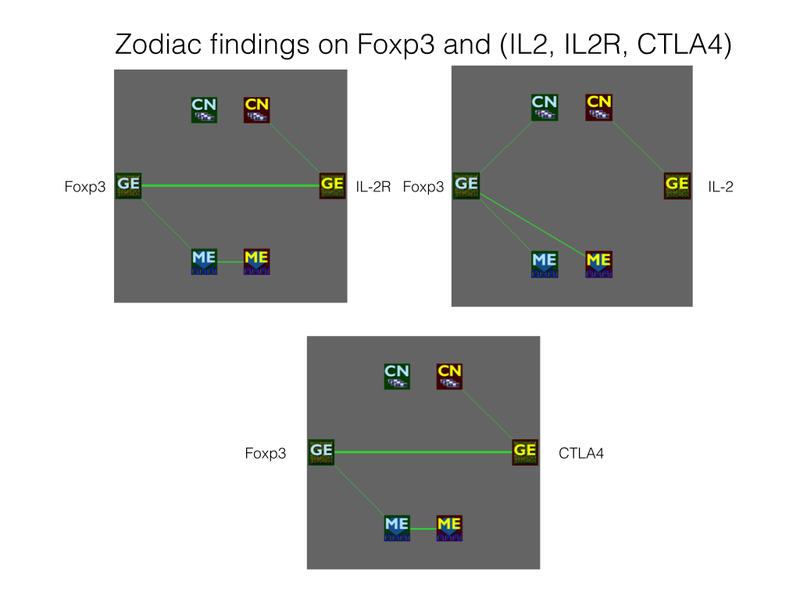 The thick green edges (strong positive associations) between GE’s (gene expression) of Foxp3 and IL-2R/CTLA4 confirm the positive associations found in the Cell paper. Interestingly, there is a green edge between GE of Foxp3 and ME (methylation) of IL2. In other words, there is a positive association of the expression of Foxp3 and methylation of IL2. 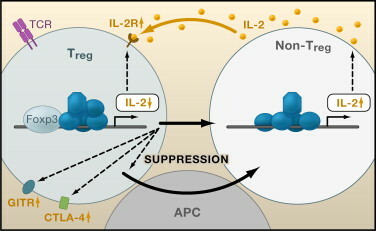 Therefore, it is likely that when the expression of Foxp3 increases more IL2 will be methylated, potentially leading to the suppression of IL2 transcription. This would agree with the figure above in the Cell paper. As a side note, CTLA4 is the target of one of the earliest FDA-approved cancer immunotherapies, Ipilimumab. 2. Foxp3 is associated with several co-factors, including RUNX1, NFAT, and potentially HDAC and NFKB. See figure below (source: Sakaguchi et al. 2008, Cell). The plot below summarizes the relationships among these genes in Zodiac. It appears that Foxp3 is indeed associated with RUNX1 and NFAT, although there is no association between Foxp3 and HDAC or NFKB. An important findings in Zodiac is that Foxp3 is associated with a large number of genes with very strong associations. This is reflected in the “beta values” which measures the odds ratio of the associations. For example, there are more than 60 genes associated with Foxp3 in Zodiac with >10 beta values. This means that the odds ratio of the association is over 2^10 = 1024. In addition, these genes appear to possess highly critical cellular functions. A list of these genes are given in the link here –> Gene list. The top genes are highly enriched with G-protein receptors, such as RXFP4, CXCR3, CXCL9, GNB3, CCR7, and GPR132. Among the gene list, there is a large number of genes related to T-, B-cells, and immune functions, including the interleukins, CD markers, tumor necrosis factors, and HLA family. The fact that so many important genes are associated with Foxp3 strongly suggests that it plays a critical function in the cellular system. This is the 12th-article of a blog series aiming to introduce Zodiac, a comprehensive tool that reveals genetic interactions in cancer by big-data computation. An introduction of Zodiac is in the 1st article here. HER3 is member of the human EGF receptor (HER/EGFR) family. The family is home of famous receptor tyrosine kinases such as HER2 and EGFR, which have been heavily targeted in cancer treatment. For example,Trastuzumab is Cetuximab are FDA-approved monoclonal antibodies (mAb) targetting HER2 and EGFR, respectively, among many other approved mAb’s. FUT3 The Lewis histo-blood group system comprises a set of fucosylated glycosphingolipids that are synthesized by exocrine epithelial cells and circulate in body fluids. The glycosphingolipids function in embryogenesis, tissue differentiation, tumor metastasis, inflammation, and bacterial adhesion. They are secondarily absorbed to red blood cells giving rise to their Lewis phenotype. This gene is a member of the fucosyltransferase family, which catalyzes the addition of fucose to precursor polysaccharides in the last step of Lewis antigen biosynthesis. It encodes an enzyme with alpha(1,3)-fucosyltransferase and alpha(1,4)-fucosyltransferase activities. Mutations in this gene are responsible for the majority of Lewis antigen-negative phenotypes. This gene seems to be related many important functions in development, cell differentiation, and tumor metastasis. Among the top genes, a few of them are related to growth factors (or their receptors) as expected. Specifically, they are either epidermal growth factor (EGF) -EGR receptor (EGFR) or hepatocyte growth factor (HGF) -HGF receptor (HGFR). They are listed below according to a descending order of statistical significance based on Zodiac. ERBB2 (this is HER2) This gene encodes a member of the epidermal growth factor (EGF) receptor family of receptor tyrosine kinases. This protein has no ligand binding domain of its own and therefore cannot bind growth factors. However, it does bind tightly to other ligand-bound EGF receptor family members to form a heterodimer, stabilizing ligand binding and enhancing kinase-mediated activation of downstream signalling pathways, such as those involving mitogen-activated protein kinase and phosphatidylinositol-3 kinase. Allelic variations at amino acid positions 654 and 655 of isoform a (positions 624 and 625 of isoform b) have been reported, with the most common allele, Ile654/Ile655, shown here. Amplification and/or overexpression of this gene has been reported in numerous cancers, including breast and ovarian tumors. MACC1 MACC1 is a key regulator of the hepatocyte growth factor (HGF; MIM 142409)-HGF receptor (HGFR, or MET; MIM 164860) pathway, which is involved in cellular growth, epithelial-mesenchymal transition, angiogenesis, cell motility, invasiveness, and metastasis. Expression of MACC1 in colon cancer (MIM 114500) specimens is an independent prognostic indicator for metastasis formation and metastasis-free survival (Stein et al., 2009 [PubMed 19098908]). GRB7 The product of this gene belongs to a small family of adapter proteins that are known to interact with a number of receptor tyrosine kinases and signaling molecules. This gene encodes a growth factor receptor-binding protein that interacts with epidermal growth factor receptor (EGFR) and ephrin receptors. The protein plays a role in the integrin signaling pathway and cell migration by binding with focal adhesion kinase (FAK). SPINT1 The protein encoded by this gene is a member of the Kunitz family of serine protease inhibitors. The protein is a potent inhibitor specific for HGF activator and is thought to be involved in the regulation of the proteolytic activation of HGF in injured tissues. Inhibition of HER3 is likely to affect these important growth factors and their receptors, therefore supporting the main findings in the PNAS paper above. What triggered me to write this blog is not these findings as they are more or less “expected”. Sure, HER3 should be associated with other growth factors and receptors, since it belongs to a family of growth factor receptor genes. Zodiac seems to confirm this general prior belief. 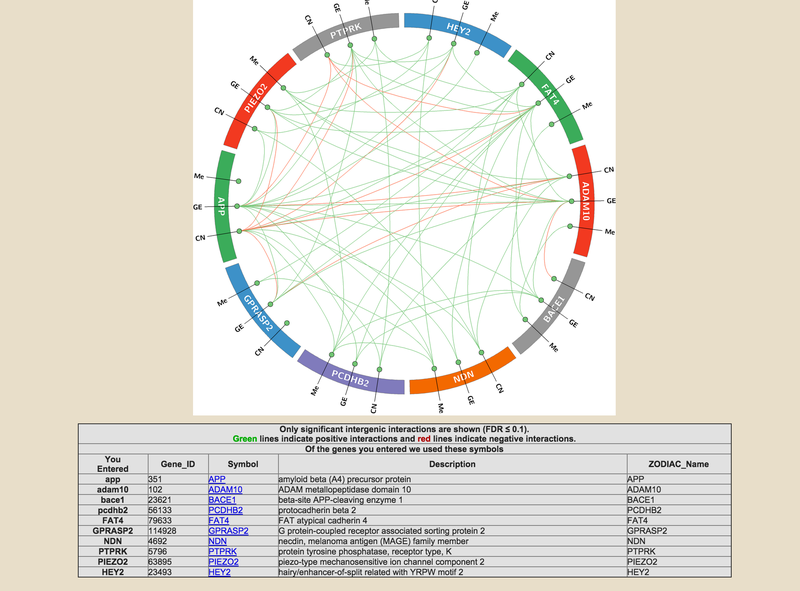 However, since Zodiac provides interactions on several other genomic features, I took a further look and found that there is an unusual large number of interactions between HER3 ME (methylation) and other genes’ GE (gene expression). See the figure below. I looked into the top 20 genes whose GE are associated with ME of HER3. The top 20 genes are overwhelmingly loaded with genes related to lymphocytes and immune cells such as NK and T cells. It appears that HER3 might be associated with liquid cancers and lymphocyte malignancies. The following genes are ordered from top as ranked by Zodiac. I removed genes without NCBI descriptions. LAG3 Lymphocyte-activation protein 3 belongs to Ig superfamily and contains 4 extracellular Ig-like domains. The LAG3 gene contains 8 exons. The sequence data, exon/intron organization, and chromosomal localization all indicate a close relationship of LAG3 to CD4. CD79A The B lymphocyte antigen receptor is a multimeric complex that includes the antigen-specific component, surface immunoglobulin (Ig). Surface Ig non-covalently associates with two other proteins, Ig-alpha and Ig-beta, which are necessary for expression and function of the B-cell antigen receptor. This gene encodes the Ig-alpha protein of the B-cell antigen component. PTPN7 The protein encoded by this gene is a member of the protein tyrosine phosphatase (PTP) family. PTPs are known to be signaling molecules that regulate a variety of cellular processes including cell growth, differentiation, mitotic cycle, and oncogenic transformation. This gene is preferentially expressed in a variety of hematopoietic cells, and is an early response gene in lymphokine stimulated cells. The non-catalytic N-terminus of this PTP can interact with MAP kinases and suppress the MAP kinase activities. This PTP was shown to be involved in the regulation of T cell antigen receptor (TCR) signaling, which was thought to function through dephosphorylating the molecules related to MAP kinase pathway. MMP25 Proteins of the matrix metalloproteinase (MMP) family are involved in the breakdown of extracellular matrix in normal physiological processes, such as embryonic development, reproduction, and tissue remodeling, as well as in disease processes, such as arthritis and metastasis. Most MMPs are secreted as inactive proproteins which are activated when cleaved by extracellular proteinases. However, the protein encoded by this gene is a member of the membrane-type MMP (MT-MMP) subfamily, attached to the plasma membrane via a glycosylphosphatidyl inositol anchor. In response to bacterial infection or inflammation, the encoded protein is thought to inactivate alpha-1 proteinase inhibitor, a major tissue protectant against proteolytic enzymes released by activated neutrophils, facilitating the transendothelial migration of neutrophils to inflammatory sites. The encoded protein may also play a role in tumor invasion and metastasis through activation of MMP2. The gene has previously been referred to as MMP20 but has been renamed MMP25. HCST This gene encodes a transmembrane signaling adaptor that contains a YxxM motif in its cytoplasmic domain. The encoded protein may form part of the immune recognition receptor complex with the C-type lectin-like receptor NKG2D. As part of this receptor complex, this protein may activate phosphatidylinositol 3-kinase dependent signaling pathways through its intracytoplasmic YxxM motif. This receptor complex may have a role in cell survival and proliferation by activation of NK and T cell responses. CCR7 The protein encoded by this gene is a member of the G protein-coupled receptor family. This receptor was identified as a gene induced by the Epstein-Barr virus (EBV), and is thought to be a mediator of EBV effects on B lymphocytes. This receptor is expressed in various lymphoid tissues and activates B and T lymphocytes. It has been shown to control the migration of memory T cells to inflamed tissues, as well as stimulate dendritic cell maturation. The chemokine (C-C motif) ligand 19 (CCL19/ECL) has been reported to be a specific ligand of this receptor. Signals mediated by this receptor regulate T cell homeostasis in lymph nodes, and may also function in the activation and polarization of T cells, and in chronic inflammation pathogenesis. CYTIP The protein encoded by this gene contains 2 leucine zipper domains and a putative C-terminal nuclear targeting signal, but does not have any hydrophobic regions. This protein is expressed weakly in resting NK and T cells. The encoded protein modulates the activation of ARF genes by CYTH1. This protein interacts with CYTH1 and SNX27 proteins and may act to sequester CYTH1 protein in the cytoplasm. GFI1 This gene encodes a nuclear zinc finger protein that functions as a transcriptional repressor. This protein plays a role in diverse developmental contexts, including hematopoiesis and oncogenesis. It functions as part of a complex along with other cofactors to control histone modifications that lead to silencing of the target gene promoters. Mutations in this gene cause autosomal dominant severe congenital neutropenia, and also dominant nonimmune chronic idiopathic neutropenia of adults, which are heterogeneous hematopoietic disorders that cause predispositions to leukemias and infections. PTPN22 This gene encodes of member of the non-receptor class 4 subfamily of the protein-tyrosine phosphatase family. The encoded protein is a lymphoid-specific intracellular phosphatase that associates with the molecular adapter protein CBL and may be involved in regulating CBL function in the T-cell receptor signaling pathway. Mutations in this gene may be associated with a range of autoimmune disorders including Type 1 Diabetes, rheumatoid arthritis, systemic lupus erythematosus and Graves’ disease. RHOH The protein encoded by this gene is a member of the Ras superfamily of guanosine triphosphate (GTP)-metabolizing enzymes. The encoded protein is expressed in hematopoietic cells, where it functions as a negative regulator of cell growth and survival. This gene may be hypermutated or misexpressed in leukemias and lymphomas. Chromosomal translocations in non-Hodgkin’s lymphoma occur between this locus and B-cell CLL/lymphoma 6 (BCL6) on chromosome 3, leading to the production of fusion transcripts. These are positive ME-GE interactions, meaning that methylation of HER3 will lead to over-expression of these genes. These findings seem to suggest that HER3 has a role in liquid cancer. This is the 11th-article of a blog series aiming to introduce Zodiac, a comprehensive tool that reveals genetic interactions in cancer by big-data computation. An introduction of Zodiac is in the 1st article here. Today I want to raise a bold question: Are genetic interactions between cancer and neurological disorders, such as Alzheimer disease (AD), similar? My current belief is that there are definitely similar genetic interactions between cancer and neurodisorders. In my previous two articles (here and here) I showed, as side notes, that some immune cancer biomarkers are related to genes with critical neurological functions. Today, I came across a Nature article published on Aug. 31, 2015, revealing a new physiological APP (this is the gene I will talk about) processing pathway, which generates proteolytic fragments capable of inhibiting neuronal activity within the hippocampus. This potentially has translational relevance for therapeutic strategies targeting APP processing in AD. PCDHB2 This gene is a member of the protocadherin beta gene cluster, one of three related gene clusters tandemly linked on chromosome five. The gene clusters demonstrate an unusual genomic organization similar to that of B-cell and T-cell receptor gene clusters. 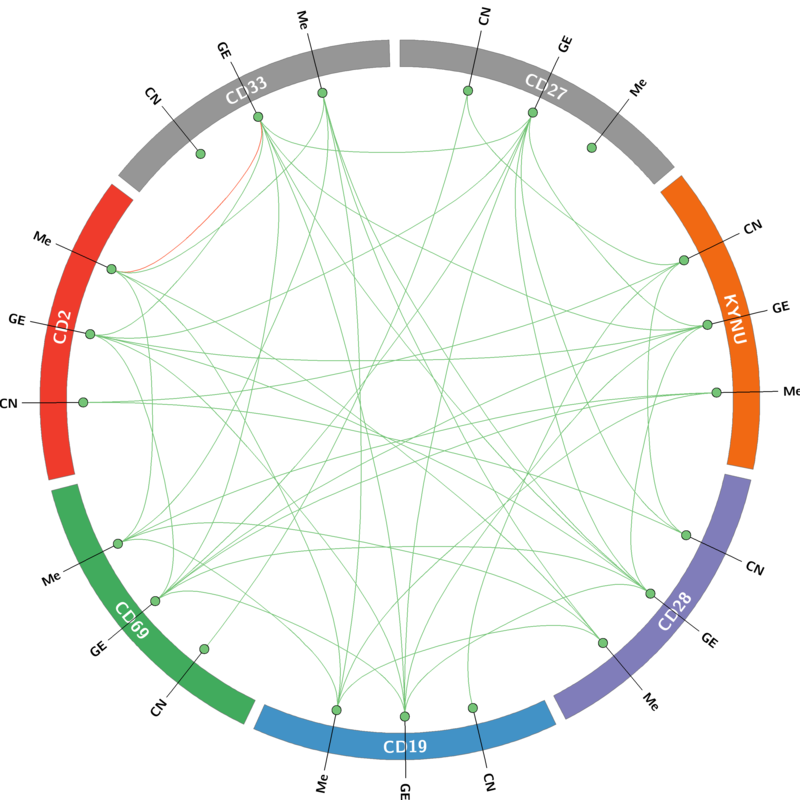 The beta cluster contains 16 genes and 3 pseudogenes, each encoding 6 extracellular cadherin domains and a cytoplasmic tail that deviates from others in the cadherin superfamily. The extracellular domains interact in a homophilic manner to specify differential cell-cell connections. Unlike the alpha and gamma clusters, the transcripts from these genes are made up of only one large exon, not sharing common 3′ exons as expected. These neural cadherin-like cell adhesion proteins are integral plasma membrane proteins. Their specific functions are unknown but they most likely play a critical role in the establishment and function of specific cell-cell neural connections. OK. I learned that the top gene “talks” with APP in cancer is PCDHB2, which is a member of a gene cluster related to cadherin. Cadherin is a critical protein that properly adheres cells together, so that they don’t wonder around in mature organs or tissues. Apparently, this is important physiologically. In cancer, cells do not properly bind to each other, and therefore become ill-shaped, like a tumor. Maybe when cells do not adhere to each other in brain, we get neural disorders, like Alzheimer? Moving down the list, the second gene with top co-expression with APP is TMTC1. Humans know nothing about this gene. FAT4 The protein encoded by this gene is a member of the protocadherin family. This gene may play a role in regulating planar cell polarity (PCP). Studies in mice suggest that loss of PCP signaling may cause cystic kidney disease, and mutations in this gene have been associated with Van Maldergem Syndrome 2. It is a gene that regulate how cells shape in the space, which is called planar cell polarity. Surprisingly, FAT4 is a gene of the same protcadherin family as PCDHB2, the top gene above! This starts to give me goosebumps! Essentially the top two genes interact with APP are from the same gene family regulating spacing of cells. And neurodisorders like AD are affected by spacing of neural cells. GPRASP2 The protein encoded by this gene is a member of a family that regulates the activity of G protein-coupled receptors (GPCRs). The encoded protein has been shown to be capable of interacting with several GPCRs, including the M1 muscarinic acetylcholine receptor and the calcitonin receptor. So it is a G protein-coupled receptor, or GPCR! What is a GPCR? It is a protein that has been awarded at least seven Nobel Prizes, including The 2012 Nobel Prize in Chemistry, awarded to Brian Kobilka and Robert Lefkowitz for their work that was “crucial for understanding how G protein–coupled receptors function.” It is apparently a very important protein and has been linked to at least the following nine physiological functions in human, among which 1, 2, 3, 4, 6, 7 are related to neural functions. Also, 5, 7 and 9 are related to cancer as well! The gustatory sense (taste): GPCRs in taste cells mediate release of gustducin in response to bitter- and sweet-tasting substances. Regulation of immune system activity and inflammation: Chemokine receptors bind ligands that mediate intercellular communication between cells of the immune system; receptors such as histamine receptors bind inflammatory mediators and engage target cell types in the inflammatory response. GPCRs are also involved in immune-modulation and directly involved in suppression of TLR-induced immune responses from T cells. Cell density sensing: A novel GPCR role in regulating cell density sensing. Homeostasis modulation (e.g., water balance). Involved in growth and metastasis of some types of tumors. NDN This intronless gene is located in the Prader-Willi syndrome deletion region. It is an imprinted gene and is expressed exclusively from the paternal allele. Studies in mouse suggest that the protein encoded by this gene may suppress growth in postmitotic neurons. NDN is related to neurons. At this point, I am convinced that Zodiac, albeit a database computed using cancer data, can reveal relationships of genes in neural disorders as well. This seems to suggest that disease-related genetic interactions in cancer and neural disorders might have overlaps. As I move down the list in Zodiac, genes related to neural functions continue to show up such as PTPRK, PIEZO2 and HEY2. Below is a Zodiac visual summary of all the genes mentioned in this article. To avoid making an overly long article, I decide to stop here. I start to suspect that many ill-functioned inter-cellular mechanisms in cancer might be also present in neural degenerate diseases such as Alzheimer. I wonder if any cancer therapies targeting these mechansims could be tested on neurodisorders, at least in cell lines and mice. This is the 10th-article of a blog series aiming to introduce Zodiac, a comprehensive tool that reveals genetic interactions in cancer by big-data computation. An introduction of Zodiac is in the 1st article here. There has been a lot of recent work discussing the association of pTEN deletion and MYC amplification with progression of prostate cancer. Led by my colleagues at NorthShore University HealthSystem, Dr. Wennuan Liu, some pioneering work has shown the association between pTEN deletion and c-MYC amplification, and its effect on the progression of prostate cancer. In addition, other work has shown that over-expression in c-MYC is also associated with bad prognosis of prostate cancer. I started a search of “PTEN” in Zodiac and looked for CN-CN (copy number-copy number) associations between other human gens and PTEN. Almost all the top genes reside on the same chromosome 10 of pTEN, implying the reason that these genes are co-deleted or co-amplified with pTEN is due to segmental changes on the chromosome spanning a large region. Zodiac successfully identified these genes as the top ranked ones in the genome. Among the list of genes that have high associations with pTEN, one gene, MXI1, stood out. 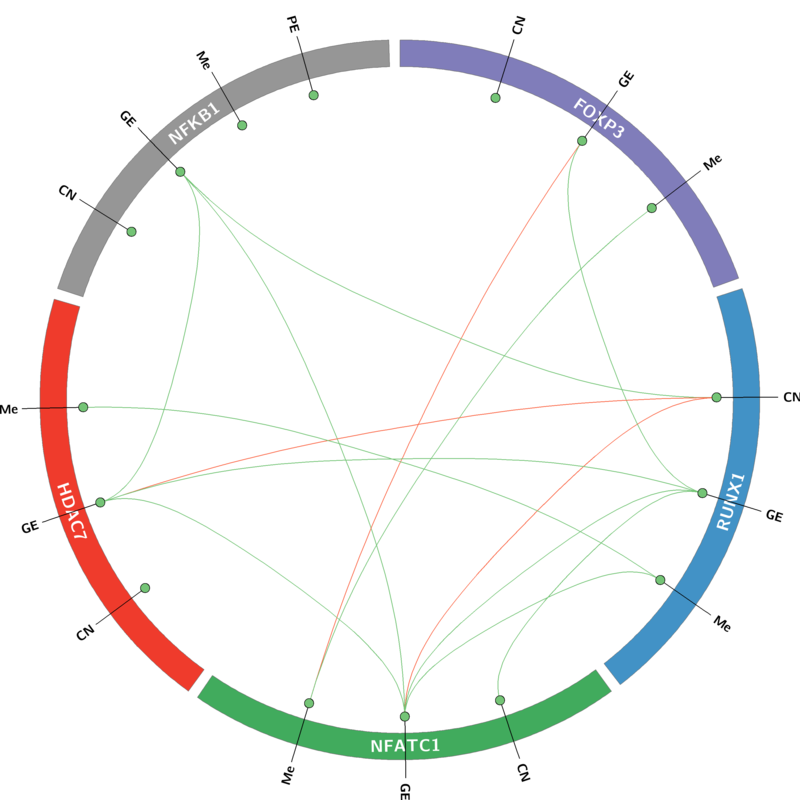 MXI1 Expression of the c-myc gene, which produces an oncogenic transcription factor, is tightly regulated in normal cells but is frequently deregulated in human cancers. The protein encoded by this gene is a transcriptional repressor thought to negatively regulate MYC function, and is therefore a potential tumor suppressor. This protein inhibits the transcriptional activity of MYC by competing for MAX, another basic helix-loop-helix protein that binds to MYC and is required for its function. Defects in this gene are frequently found in patients with prostate tumors. pTEN deletion is associated with MXI1 deletion due to their proximity on the genome. MXI1 deletion leads to down regulation of MXI1 expression which then leads to up regulation of MYC expression. Our team is currently working on a full analysis of pTEN, MXI1, and MYC in prostate cancer data of TCGA. This new hypothesis could potentially explain the association between pTEN deletion and MYC over expression. However, it does not explain the association between pTEN deletion and MYC amplification. Reasons for joint copy number changes are still mostly unknown to humans. Zodiac has all the copy number co-changes for pairs of genes and could be queried to reveal any potential patterns. Lastly, MXI1 might be an important gene for prostate cancer progression, especially metastasis to bone. Below are a couple of genes among the top ones that have positive GE-GE association with MXI1. They are known prognosis markers for prostate cancer. BMP6 The bone morphogenetic proteins (BMPs) are a family of secreted signaling molecules that can induce ectopic bone growth. Many BMPs are part of the transforming growth factor-beta (TGFB) superfamily. BMPs were originally identified by an ability of demineralized bone extract to induce endochondral osteogenesis in vivo in an extraskeletal site. Based on its expression early in embryogenesis, the BMP encoded by this gene has a proposed role in early development. In addition, the fact that this BMP is closely related to BMP5 and BMP7 has lead to speculation of possible bone inductive activity. TNFRSF11B The protein encoded by this gene is a member of the TNF-receptor superfamily. This protein is an osteoblast-secreted decoy receptor that functions as a negative regulator of bone resorption. This protein specifically binds to its ligand, osteoprotegerin ligand, both of which are key extracellular regulators of osteoclast development. Studies of the mouse counterpart also suggest that this protein and its ligand play a role in lymph-node organogenesis and vascular calcification. Unfortunately, the top gene C11ORF88 that is associated with MXI1 in terms of GE is an open read frame. This gene has much stronger association with MXI1 than any other genes, but humans know nothing about it! I hope this blog could generate some new research direction for prostate cancer, especially its mechanism of progression and metastasis. Zodiac (Case 8): CD19-Targeting Chimeric Antigen Receptor (CAR) T-Cell Cancer Therapy — What does Zodiac know about CD19? This is the 8th-article of a blog series aiming to introduce Zodiac, a comprehensive tool that reveals genetic interactions in cancer by big-data computation. An introduction of Zodiac is in the 1st article here. CD19-targeting CART immunotherapy made a splash recently (see here) as a potentially revolutionary cancer therapy. So far CART targeting CD19 has shown remarkable therapeutic effects in a small group of hematological cancer patients. Due to these initial promising results, a large number of clinical trials have now been proposed or started based on CART therapies. CD19 is one of the earliest biomarkers for CART for drug development and here I describe a set of top genes that co-express with CD19 in Zodiac. Based on a false discovery rate of 0.01 threshold, Zodiac returns 1,343 co-expressed genes with CD19. I looked at the top 20 of them. CD69 This gene encodes a member of the calcium dependent lectin superfamily of type II transmembrane receptors. Expression of the encoded protein is induced upon activation of T lymphocytes, and may play a role in proliferation. Furthermore, the protein may act to transmit signals in natural killer cells and platelets. GPR183 This gene was identified by the up-regulation of its expression upon Epstein-Barr virus infection of primary B lymphocytes. This gene is predicted to encode a G protein-coupled receptor that is most closely related to the thrombin receptor. Expression of this gene was detected in B-lymphocyte cell lines and lymphoid tissues but not in T-lymphocyte cell lines or peripheral blood T lymphocytes. The function of this gene is unknown. ST14 The protein encoded by this gene is an epithelial-derived, integral membrane serine protease. This protease forms a complex with the Kunitz-type serine protease inhibitor, HAI-1, and is found to be activated by sphingosine 1-phosphate. This protease has been shown to cleave and activate hepatocyte growth factor/scattering factor, and urokinase plasminogen activator, which suggest the function of this protease as an epithelial membrane activator for other proteases and latent growth factors. The expression of this protease has been associated with breast, colon, prostate, and ovarian tumors, which implicates its role in cancer invasion, and metastasis. GZMA codes granzymes that are serine proteases that are released by cytoplasmic granules within cytotoxic T cells and natural killer (NK) cells. They induce programmed cell death in the target cell, thus eliminating cells that have become cancerous or are infected with viruses or bacteria. The granzymes also kill bacteria and inhibit viral replication. In NK cells and T cells, the granzymes are packaged in cytotoxic granules with perforin. More about granzymes and perforin will be described in my future blog, which I plan to put together a comprehensive map between them and other CD markers using Zodiac. Potentially, I might also leak a new gene, the function of which is unknown, but might play critical roles in immune system. I hope that the new gene could help cancer drug development. KYNU Kynureninase is a pyridoxal-5’s-phosphate (pyridoxal-P) dependent enzyme that catalyzes the cleavage of L-kynurenine and L-3-hydroxykynurenine into anthranilic and 3-hydroxyanthranilic acids, respectively. Kynureninase is involved in the biosynthesis of NAD cofactors from tryptophan through the kynurenine pathway. which is a gene related to Kynurenine. From Wikipedia, “Kynurenine is synthesized by the enzyme tryptophan dioxygenase, which is made primarily but not exclusively in the liver, and indoleamine 2,3-dioxygenase (IDO), which is made in many tissues in response to immune activation. Kynurenine and its further breakdown products carry out diverse biological functions, including dilating blood vessels during inflammation and regulating the immune response. Some cancers increase kynurenine production, which increases tumor growth. ” Here, I suspect that there is a relationship between kynurenine pathway and CD19. Interesting, a recent paper in Blood confirmed my suspicion. The authors show that enhanced kynurenine blocks CD19-CART effect in xenocraft models and preconditioning chemotherapies suppressing IDO improve the anti-tumor effects of CD19-CART. Zodiac shows that KYNU is highly positively associated with CD19 (beta-value 11.9). This suggests that a high KYNU expression in TCGA tumor samples (which could be mixed tumor/stroma) could reduce CD19-related-immune-cell anti-cancer effect by its silencing mechanism of CD19-immune cells. In other words, KYNU could be a co-immune blockade gene. Zodiac also shows that KYNU is positively associated with many other CD markers, most of which are being investigated for immunotherapies in cancer. Below is a picture from Zodiac showing associations between KYNU and CD markers. Lastly, like the previous post on CD33, I also found genes associated with CD19 possessing important neural and cognitive functions. SEPT1 This gene is a member of the septin family of GTPases. Members of this family are required for cytokinesis and the maintenance of cellular morphology. This gene encodes a protein that can form homo- and heterooligomeric filaments, and may contribute to the formation of neurofibrillary tangles in Alzheimer’s disease. In the press release for a successful phase I trial for a CD19-targeting CART, it was stated that “T-cell activation causes the release of inflammatory cytokines, producing symptoms including high fevers, aches, hypotension, and, more rarely, pulmonary edema and neurologic effects such as delirium.” Delirium is an organically-caused decline from a previously attained baseline level of cognitive function. It appears that the neurological side effects of CD-marker-targeting CART might be due to the association of neurologically related genes and the CD markers. This is the 7th-article of a blog series aiming to introduce Zodiac, a comprehensive tool that reveals genetic interactions in cancer by big-data computation. An introduction of Zodiac is in the 1st article here. CD33 has been used as a cell surface target for treating myeloid leukemia. Lintuzumab is currently an investigational monoclonal antibody (mAB) that targets CD33 for treating myeloid leukemia. Other mABs are also being developed although efficacy has not been impressive so far. There is a renewed interest in targeting CD33, using activated Natural Killer (NK) cells, which are considered as a type of innate immune cells. I took a look at CD33 in Zodiac and found the following genes that are associated with CD33 with strong co-expression. CD163 The protein encoded by this gene is a member of the scavenger receptor cysteine-rich (SRCR) superfamily, and is exclusively expressed in monocytes and macrophages. It functions as an acute phase-regulated receptor involved in the clearance and endocytosis of hemoglobin/haptoglobin complexes by macrophages, and may thereby protect tissues from free hemoglobin-mediated oxidative damage. This protein may also function as an innate immune sensor for bacteria and inducer of local inflammation. CD53 The protein encoded by this gene is a member of the transmembrane 4 superfamily, also known as the tetraspanin family. Most of these members are cell-surface proteins that are characterized by the presence of four hydrophobic domains. The proteins mediate signal transduction events that play a role in the regulation of cell development, activation, growth and motility. This encoded protein is a cell surface glycoprotein that is known to complex with integrins. It contributes to the transduction of CD2-generated signals in T cells and natural killer cells and has been suggested to play a role in growth regulation. Familial deficiency of this gene has been linked to an immunodeficiency associated with recurrent infectious diseases caused by bacteria, fungi and viruses. CD86 This gene encodes a type I membrane protein that is a member of the immunoglobulin superfamily. This protein is expressed by antigen-presenting cells, and it is the ligand for two proteins at the cell surface of T cells, CD28 antigen and cytotoxic T-lymphocyte-associated protein 4. Binding of this protein with CD28 antigen is a costimulatory signal for activation of the T-cell. Binding of this protein with cytotoxic T-lymphocyte-associated protein 4 negatively regulates T-cell activation and diminishes the immune response. CD37 The protein encoded by this gene is a member of the transmembrane 4 superfamily, also known as the tetraspanin family. Most of these members are cell-surface proteins that are characterized by the presence of four hydrophobic domains. The proteins mediate signal transduction events that play a role in the regulation of cell development, activation, growth and motility. This encoded protein is a cell surface glycoprotein that is known to complex with integrins and other transmembrane 4 superfamily proteins. It may play a role in T-cell-B-cell interactions. Apparently, these CD-markers all have a role in immune defense, some directly related to NK cells. The following genes also strongly co-express with CD33 in tumor samples. Their functions are related to immune defense as well. For example, SAMHD1 directly involves in the regulation of innate immune response. ITGAM This gene encodes the integrin alpha M chain. Integrins are heterodimeric integral membrane proteins composed of an alpha chain and a beta chain. This I-domain containing alpha integrin combines with the beta 2 chain (ITGB2) to form a leukocyte-specific integrin referred to as macrophage receptor 1 (‘Mac-1’), or inactivated-C3b (iC3b) receptor 3 (‘CR3’). The alpha M beta 2 integrin is important in the adherence of neutrophils and monocytes to stimulated endothelium, and also in the phagocytosis of complement coated particles. IFI30 The protein encoded by this gene is a lysosomal thiol reductase that at low pH can reduce protein disulfide bonds. The enzyme is expressed constitutively in antigen-presenting cells and induced by gamma-interferon in other cell types. This enzyme has an important role in MHC class II-restricted antigen processing. SAMHD1 This gene may play a role in regulation of the innate immune response. The encoded protein is upregulated in response to viral infection and may be involved in mediation of tumor necrosis factor-alpha proinflammatory responses. Mutations in this gene have been associated with Aicardi-Goutieres syndrome. Lastly, interestingly Zodiac showed three genes that co-express with CD33 and are related to neurological functions. PVALB The protein encoded by this gene is a high affinity calcium ion-binding protein that is structurally and functionally similar to calmodulin and troponin C. The encoded protein is thought to be involved in muscle relaxation. See also a paper here. ADORA3 This gene encodes a protein that belongs to the family of adenosine receptors, which are G-protein-coupled receptors that are involved in a variety of intracellular signaling pathways and physiological functions. The receptor encoded by this gene mediates a sustained cardioprotective function during cardiac ischemia, it is involved in the inhibition of neutrophil degranulation in neutrophil-mediated tissue injury, it has been implicated in both neuroprotective and neurodegenerative effects, and it may also mediate both cell proliferation and cell death. Alternative splicing results in multiple transcript variants. This gene shares its 5′ terminal exon with some transcripts from overlapping GeneID:57413, which encodes an immunoglobulin domain-containing protein. TNFRSF1B The protein encoded by this gene is a member of the TNF-receptor superfamily. This protein and TNF-receptor 1 form a heterocomplex that mediates the recruitment of two anti-apoptotic proteins, c-IAP1 and c-IAP2, which possess E3 ubiquitin ligase activity. The function of IAPs in TNF-receptor signalling is unknown, however, c-IAP1 is thought to potentiate TNF-induced apoptosis by the ubiquitination and degradation of TNF-receptor-associated factor 2, which mediates anti-apoptotic signals. Knockout studies in mice also suggest a role of this protein in protecting neurons from apoptosis by stimulating antioxidative pathways. In summary, Zodiac confirms the close relationship between CD33 and immune cells. The suggested genes maybe further evaluated. A few genes that co-express with CD33 also relate to neurological functions.